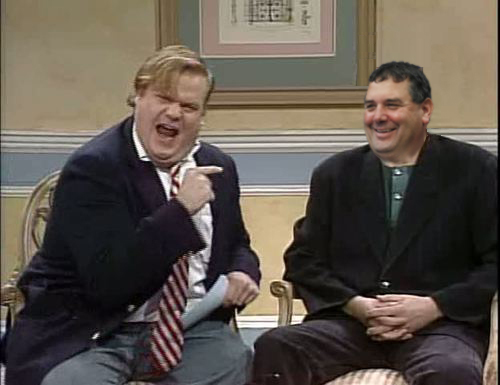 Remember that time you beat Ohio? That was awesome. Michigan comes out in a three-wide (twins to the top of the screen), two-back set. Ohio State is in a 4-3 under (hey!). Before the snap, you can see a blitz coming from the weakside cornerback (bottom of the screen). He'll attempt to time the snap but jumps a little early. 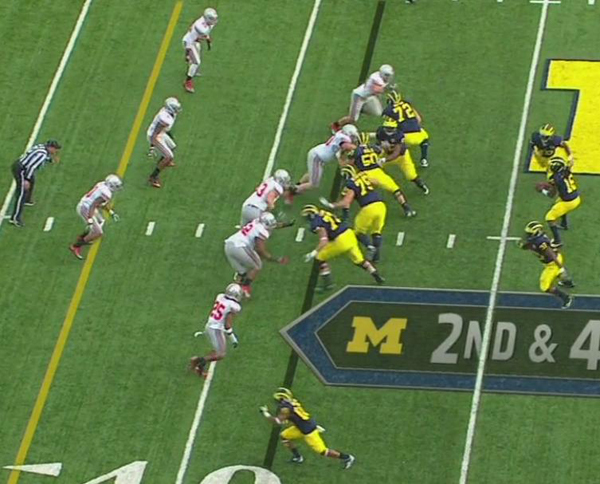 As the ball is snapped, Michigan's offensive line begins to zone block to the right. Patrick Omameh will pull across to the weakside of the formation. 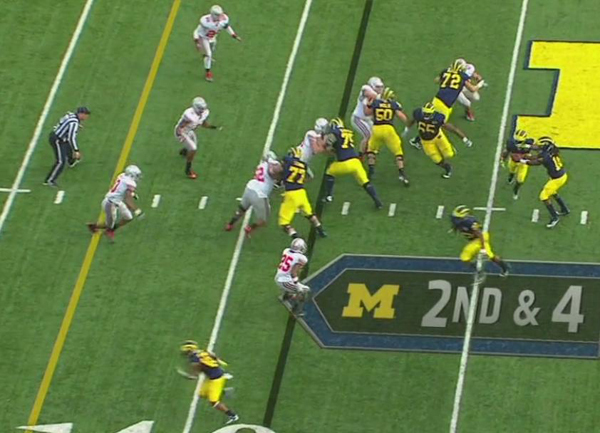 Ohio State's defensive line is slanting to the strongside, so Omameh gets caught up in the wash a little bit. His pull isn't clean. Fullback Stephen Hopkins is heading upfield to block the blitzing cornerback. At the mesh point, I'm not really sure who Denard is reading. He is either reading the middle or weakside linebacker. Omameh unearths himself from the offensive line and continues to pull. As Fitz Toussaint comes out of the mesh point, Denard pulls the ball, but I'm not sure why. If he's reading the middle linebacker (#6 in the middle of the screen), he should hand the ball off, but I'm not sure that's who he's reading. If he's reading the weakside linebacker (just below #6), I suppose he should pull the ball because he's further outside (?). Regardless, Denard pulls the ball. 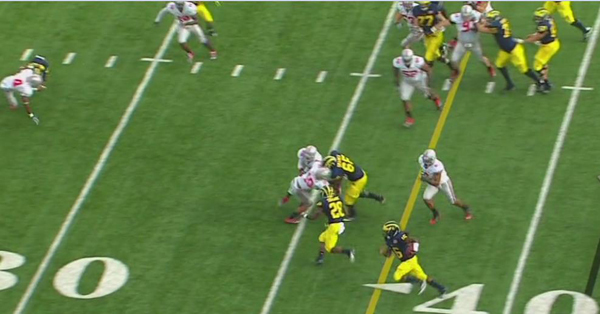 Denard bounces outside behind Omameh and gets to the sideline for a touchdown. Lesson: Denard is better than you. Probably. Despite the outcome, I'm not sure if he made the proper read here. With Omameh pulling to block the weakside linebacker, it seems like Denard is reading the middle linebacker who diagnoses the play and is in position to make a tackle. But then Denard Denards him and runs for a touchdown. 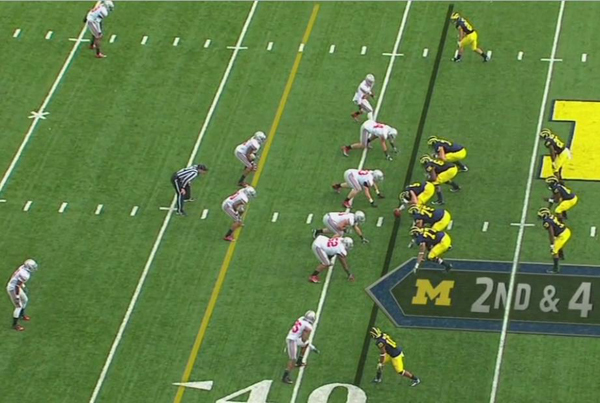 Regardless, Michigan didn't use this play all year until Borges unleashed it against Ohio State. There frankly weren't many new plays that the team showed on either side of the ball against the Buckeyes but they few that were deployed (this one specifically) were wildly effective. Anyone with any insight into what Denard's read is here would be appreciated. 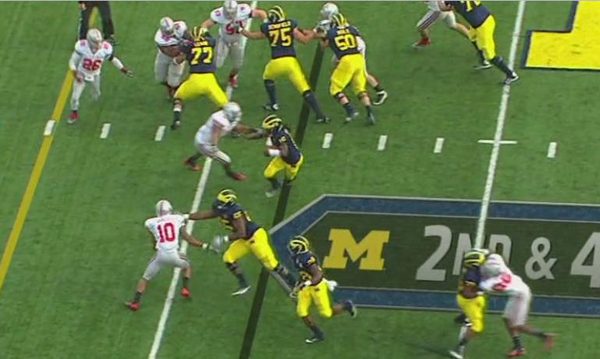 I think it's possible that Denard is reading the middle linebacker. 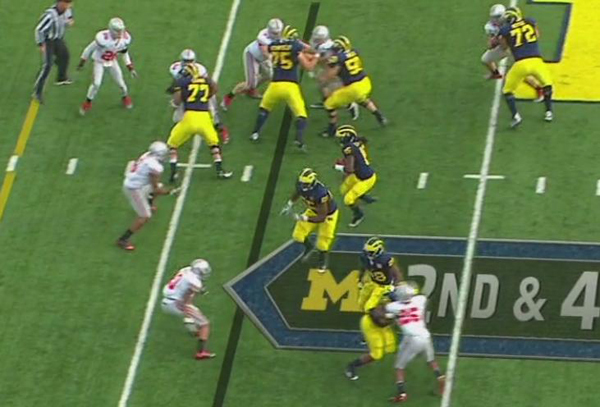 He ends up making the wrong read here because #6 is obscured by Lewan. Denard probably thinks #6 has made a move upfield and to the strong side so he pulls it. He made the wrong read and won on athleticism. Fitz probably would have scored on this play as well. He should be reading Shazier, #10, and he makes the right read. Omameh screwed up by blocking the guy the play options off. Agreed, the will replaces the blocked frontside end and is the one being optioned here most likely. 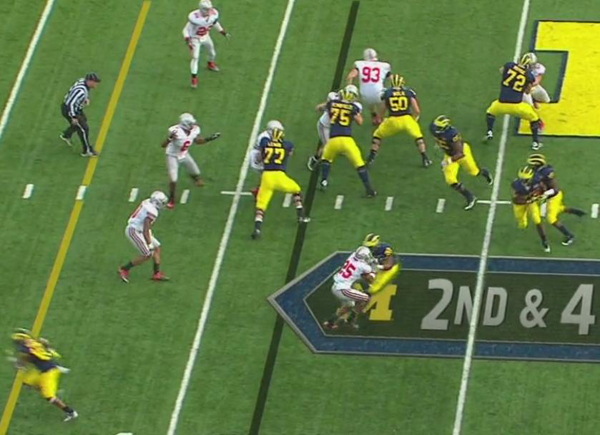 Brian, did Heiko get the right answer in the roundtable when Hoke called this a "jet read" or was he confused as to what you guys were actually asking about?